The Department of Science has long established links with industries across the South East and beyond. These links are continuously growing through engagement of “industry experienced staff” and with the recently established “School of Science and Computing Industry Board”. Employment-Academic partnerships allows for collaboration in the areas of; programme review and development, student recruitment and promotion, student placement, graduate recruitment, employee upskilling and lifelong learning and for innovative approaches in teaching, learning and research. The Work Placement Programme for Science students at WIT is an integral, accredited module for many of our third year undergraduate students. Work Placement gives students the opportunity to apply the theory they have acquired on their degree programme to real-world problems and tasks, in an industry setting. It also enables third level institutions to interface more effectively with industry partners and to build relationships with companies in the region and nationally. The recruitment procedure at WIT is flexible and open to the needs of individual employers. 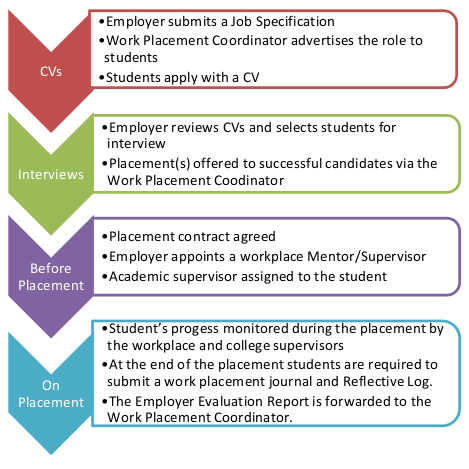 In most cases, the Placement Coordinator advertises a job specification for the placement role internally to the students, with an indication of the skills required, etc.